In Walt Disney World’s EPCOT theme park, just across the walkway from the China pavilion in the World Showcase, there is a certain rock formation that is distinctive because it has a “doughnut hole” shape cut into it. Many of you reading this may recognize it. Here’s what it looks like on a normal day in May. During the winter holiday season, that same rock formation gets dressed up in red, China’s favorite color – we discussed this yesterday! 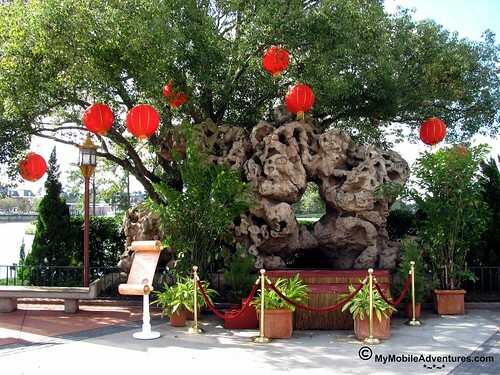 Here’s what the area looks like adorned with festive red lanterns. And here’s what it looks like when you are standing in the exact right spot on the path – the “doughnut hole” perfectly frames a lovely young tree that grows on an island in the middle of World Showcase lagoon. 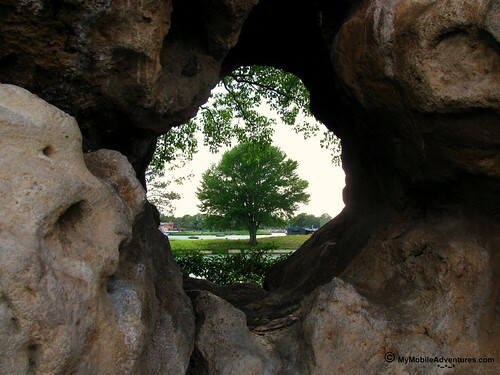 Love the pictures…the tree through the hole shot is so cool! I love the tree framed by the doughnut hole! I don’t remember seeing that rock formation when we were at Epcot last spring…I am sorry that I missed it. How pretty it is during the holiday season, though! Alicia, I’m trying to think of other “through the hole” shots at Disney World. So far, all I’m coming up with is the Mickey head “doughnut holes” on the fence at Downtown Disney’s Marketplace. If you think of any more, let me know! Carolyn, I must have passed that rock a bazillion times before I noticed the tree in the doughnut hole. You really do have to be standing in a specific spot to even realize that it’s there. I have never seen this. What an interesting rock formation. Thank you for sharing something I will never see. Wow! I LOVE it, thanks for sharing. 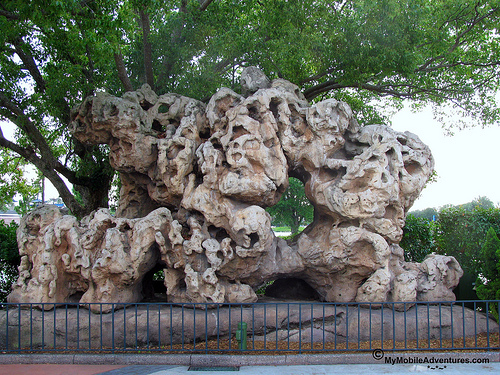 Those look like the rockeries that I saw in many traditional gardens in China (that is the official term for them). It’s a traditional practice of cementing together rocks from lake beds into interesting shapes. An interesting art form and a perfect frame for you photograph of the tree! I love the tree framed by the rock. I like the lanterns shot as well as the tree-in-the-middle one. That last photo is a stunner. Thanks for sharing it with us. Have a wonderful Outdoor Wednesday.